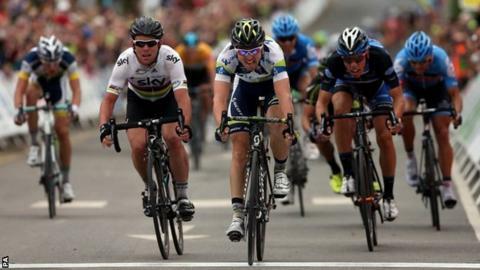 Australia's Leigh Howard outsprinted Mark Cavendish to win stage two of the Tour of Britain on Merseyside. Britain's world road race champion was led out by Team Sky team-mates Bradley Wiggins and Luke Rowe but Howard held on after jumping clear. Rowe was unable to keep the overall lead because he did not contest the sprint, finishing in the main bunch. Boy van Poppel, of the Netherlands, takes the leader's jersey with Howard second on the same time. "There is a temptation to say Mark Cavendish 'loses' every time he fails to win a sprint, but sometimes, as Cavendish's boss Dave Brailsford put it, you just get "rolled". The roller here was Australia's Leigh Howard, no slouch and an ex-team-mate of Cav's at HTC. It was a great win and he deserves an extra rasher at breakfast. But this did feel like a loss for Cavendish and his Sky colleagues. In control with 1km to go, they got the last corner wrong, leaving the world champion with too much to do. They will go again, that is for sure, and an angry Cav is usually a winning Cav." Rowe now sits one second behind the leaders in third heading into stage three from Jedburgh to Dumfries on Tuesday. "With 600m to go I led into it with Cav in my wheel," Rowe told ITV4. "He said he wanted to try and let me go and slip a few wheels back. We knew there was a bit of a dip and he'd use the run. "But on that dip the riders switched from right to left and he got a bit chopped up. Cav's shown how fast he was in that finish. "It's frustrating but you could see how fast he was coming up at the line." Britain's Peter Williams took the sprinters' jersey after winning the stage's three intermediate sprints. Williams was joined by compatriots Russell Hampton and Richard Handley in a six-man breakaway on the 180.7km race from Nottingham to Knowsley Safari Park, via the Peak District in Derbyshire. Spain's Pablo Urtasun was among the leaders, taking the king of the mountains jersey after being first over the day's three categorised climbs. With around 50km remaining Orica GreenEdge's Jack Bobridge broke clear of his fellow escapees but the Australian was immediately joined by Williams, and as the other four riders were swallowed up by the peloton, the duo extended their advantage to more than two minutes. However, the Team Sky-led peloton reduced the gap to less than 30 seconds and with 25km remaining Bobridge and Williams sat up and shook hands before they too were consumed by the main bunch. Several riders attempted to break clear in the final 20km but Team Sky, led by Austria's Bernhard Eisel, continued to control the pace with Jeremy Hunt, Christian Knees, Wiggins, Rowe and Cavendish in his wheel. Eisel dropped away with 10km remaining and Poland's Marcin Bialoblocki made a lone break as several teams tried to control the pace. Bialoblocki stayed clear until the closing 3km as Team Sky again assumed control, with Wiggins leading the race into the final kilometre. However, when the Olympic time trial champion pulled to one side, Cavendish appeared to get boxed in and was unable to catch Howard.